The Jerry O'Connell Single Coin Purse, is the perfect solution for carrying and protecting your regular and gimmicked coins or gimmicked rings. Hand made of the highest quality leather, this case will protect your coins and also help prevent you spending them whilst you are not using them. The case is large enough to hold up to 4 coins with a shell effect or a folded money effect and is a great way to add that professional touch to your performance. 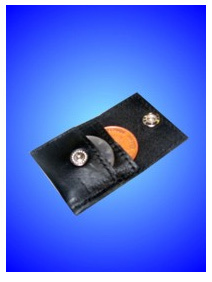 Very nice wallet, I can fits 4 .50c half dollars, or 2 poker chips very easy and comfortable. Fits 6 .50c half dollars fairly well. I wish it would hold 3 poker chips. but I would have to break it in a bit. It is made beautifully, comes in a nice padded box. DOWNSIDE: Its small, I would pay $6-$8 maybe but $12 is a bit much for something so small. There is no tricks involved, just a wallet. But I really do love it. If the price was better I would buy a few more.